A planned new Guernsey football team will not damage the island's league system, according to its manager. Guernsey United is being set up to try and give the best players from the Priaulx League the chance to play in matches against new opposition. Steve Sharman says the side could play in cup competitions or their own event. 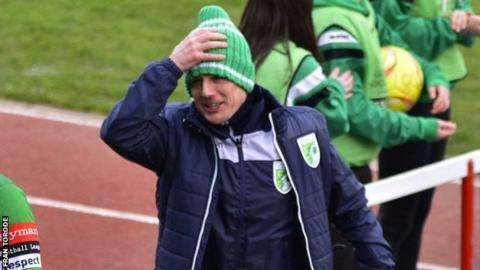 "It has to be done with the complete agreement of the league programme over here, so it's not trying to compete with anybody," he told BBC Guernsey. The squad of players that are currently training under Sharman are the side which represented Guernsey in the FA Inter-League Cup earlier this season. The side were beaten in the opening round after a 1-0 away defeat at the hands of the South Amateur League after extra-time. "We could invent our own competition and invite the services and Jersey teams to take part," he added to BBC Sport. "It's purely down to availability of players and it's offering that development opportunity throughout the year for our players to make the next step." But Sharman says the side would not take part in Jersey's Le Riche Cup. The tournament, which is Jersey's main cup competition, has seen a number of Priaulx League sides take part over the past few years, with Vale Rec making this season's semi-final. "I don't want to do anything where the Priaulx clubs have already made a step into," he added. "We can do something ourselves or we could decide to enter an English cup. Sharman added to BBC Radio Guernsey: "The crux of this is not to put one group against another group. "The players, we hope. will be able to play every single fixture for their GFA clubs and we will work around that and just give them a different opportunity. "It's been the same environment for the last 20, 30, 40, 50 years. "People are worried about change and new ideas, but if we all approach this in the right way, and we realise that the reason that we're doing this is for the players, then actually we shouldn't be doing anything wrong."